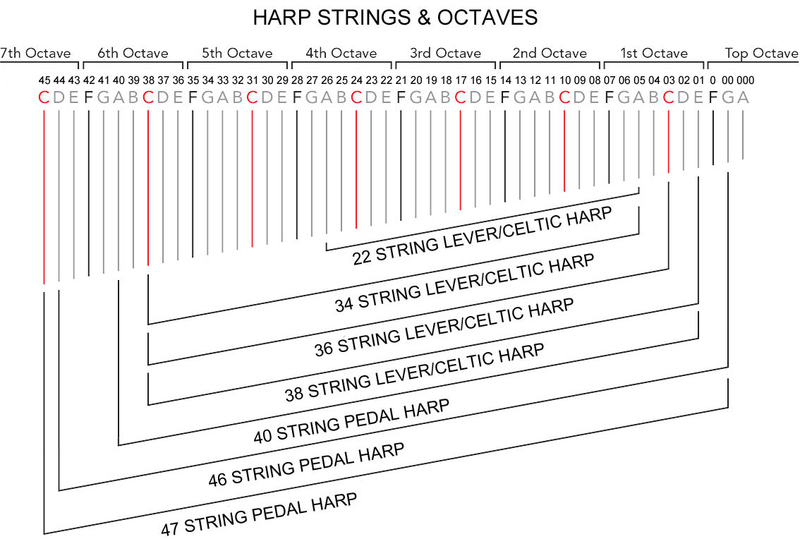 In this tutorial guide we’ll take you through identifying a harp string, the octave in which the string sits, string gauge and some of the differences between the different materials used for making the strings. The guide is provided in text, diagrams and photos below – you can also watch Allan our chief harp maker explaining it all in person in the video on the right. If you want to change or replace a harp string and don’t know how then we explain this in the next guide in this series – ‘How To Change A Harp String’. If you need a replacement string, please contact us. 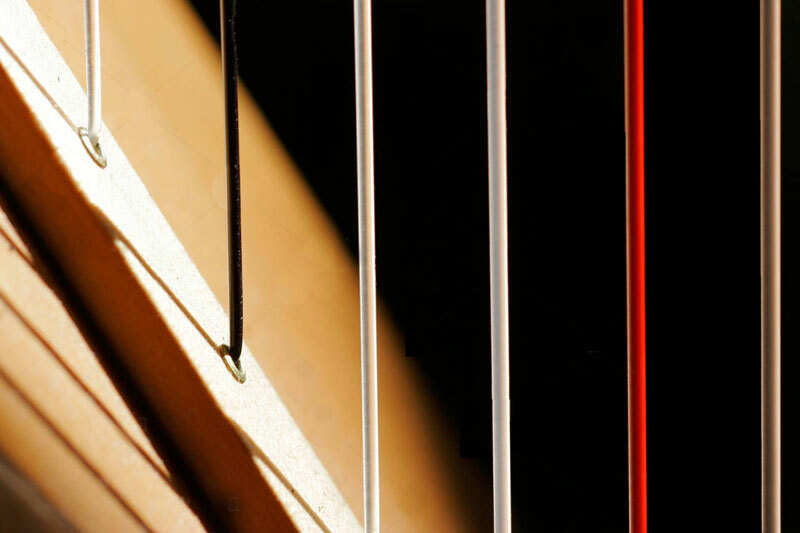 The standard colour system on all modern concert and lever or Celtic harps uses Red for a C and Black for F. Harp strings are colour coded in order for the harpist to identify where he/or she is in the octave (and play the right notes!). This system reaches back nearly 200 years. Please note: Some harp string suppliers use different dyes in their strings so sometimes a C string can appear a little purple or an F string a little dark-blue. Some makers of nylon strings in particular use blue for their Fs. If you need a larger image please click on the diagram. How do I tell the octave? Sometimes identifying which octave a string sits in on a harp can be confusing, but it is crucial if you want to order the correct string! Unlike piano octaves (which run from C to C), octaves on a harp run from E to E. In addition to this, if you have a lever harp, the top string does not necessarily denote the beginning of the ‘1st Octave’. This is because historically, pedal harps have defined the octaves and they have a greater range. The diagram on the left demonstrates the start and end point of various harps (please note there may be variations from these averages). The ‘Top Octave’ is a historical anomaly which came about as a result of Gothic harps extending the top range of concert harps. Since Grecians and other pedal harps were already denoting 1st Octave E as number one, strings higher than this pitch were denoted 0,00 and 000. Which gauge of harp strings should I use? 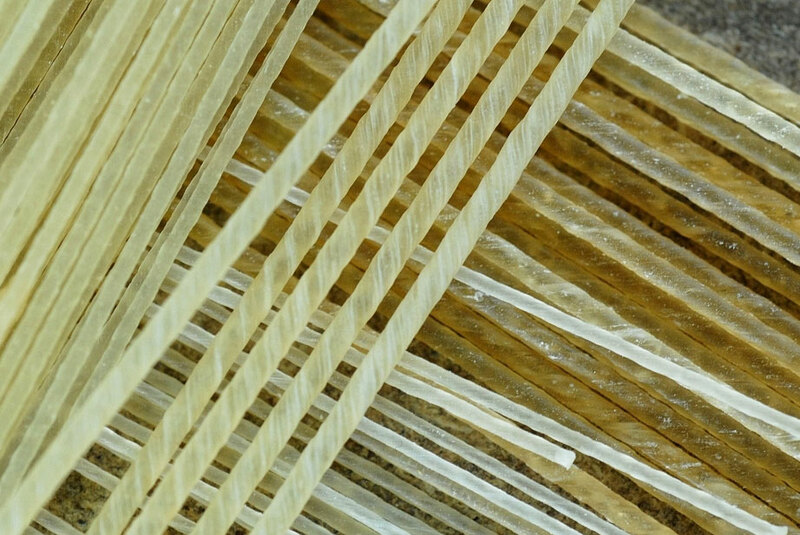 Harp strings come in a variety of different materials and gauges (thicknesses). It is important that you put the correct gauge strings on your harp, as not doing so may damage it. Do not assume that two harps with the same number of strings use the gauge of string, as every harp model is different. The maker of your harp should usually supply you with a string gauge chart when you purchase a harp. If you need to replace a string and don’t know the gauge, using the old string is a good way to help determine the gauge (you can measure the diameter using a micrometer). Some harps are designed to take a variety of string gauges to cater for different sounds, tensions and playing styles. Teifi Harps offers a number of stringing options. What are the differences between harp string types? In addition to different string gauges, harpists are often faced with a plethora of different string materials to chose from. Each string type has its own characteristics, advantages and disadvantages. We’ve compiled a handy comparison table of the most common harp string materials so you can make an informed decision when buying strings.